The sheer density of Shanghai sort of hits you in the face as you drive into it. Some say the city is literally sinking under the weight of it’s own development. It’s also said that half of the construction cranes working in the world are in China - and most of them are right here in Shanghai. At night, when the sky is dark and the spectacular buildings are lit, you don’t notice the cranes. You see one of the greatest and most diverse living architectural museums in the world. Sure, it may get old on the daily grind, but getting caught in a traffic jam here can be a joy, and can give you time to examine just how many different and unique skyscrapers and buildings exist in one city. Twilight greeted us as we approached the dense city, but Shanghai was already lit up before us. We didn’t waste time checking into our hotel yet—we went right into the sights and sounds and smells of the city. 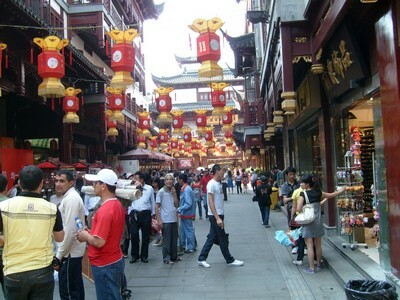 Our first stop in Shanghai: the Yu Gardens and Bazaar. The hustle and bustle of this old-style street market can be overwhelming, where stores and vendors peddle everything from medicine to jewelry. Street performers did acrobatics and played music on traditional instruments. The City God Temple within the labyrinth of commerce dates back to the Ming dynasty and featured large statues, incense burning before them. At the center of the Yu area is the charming Huxinting Teahouse, dating back to 1784. We crossed the bridge of nine zigzags over the water to get to the iconic palace of tea. After enjoying a cup of tea in the tearoom, we decided to purchase a canister as a gift. Inspired by an earlier visit to the Longjing “dragon well” tea plantation, we bought another canister here from Huxingting Teahouse before zigzagging across the opposite bridge back to the market streets. The gardens that make up a good portion of the Yu area were beautiful, but paled in comparison to the gardens we’d enjoyed in Hangzhou and Suzhou. Aside from the huge rockery (one of the largest) it felt a little like we were perusing a flea market after shopping at a Macy’s. Perhaps more chaotic than touristy, the most interesting part of the bazaar itself was the “underground” one. Our guide gave the password at a big, black, iron gate, and it screeched open to admit us into Shanghai’s “black market.” There, you could find everything from Gucci and Louis Vuitton and Polo to Ray Ban and Rolex and Mont Blanc. It was explained to us more than once on the trip, by guides and hosts, that it is not recommended to buy knock offs on the street, but that when you go to the right place, Chinese experts can make copies that surpass the originals in quality. Knock offs that are better than what they’re knocking off? It was an interesting concept, and a tempting one to buy into. When it came time for some members of our party to pay for their goods, our group was escorted to another shop to pay and then back to the black market to take the goods. Money didn’t transfer directly from the seller to the buyer. A donation in one store, a gift in another. A profitable coincidence. When we finished exploring the infamous black market, we went back through the sea of street venders to the bus and headed through the night’s lit-up architecture. Our driver took us to the most iconic night scene that Shanghai has to offer. At the river’s edge, in the area known as the Bund, we could see the older buildings from the European colonial era on one side, and the modern marvels on the futuristic side known as the Pudong. The Pudong looked like something out of a science fiction movie. The Bund dates back to the mid 1800s, when the British colonized the area. Towering along the river are stately buildings that seem to stand as a symbol of Westernization. Among them are the Customs House, Palace Hotel, Bank of China, and Shanghai Pudong Development Bank, once considered one of the most beautiful buildings in Asia. 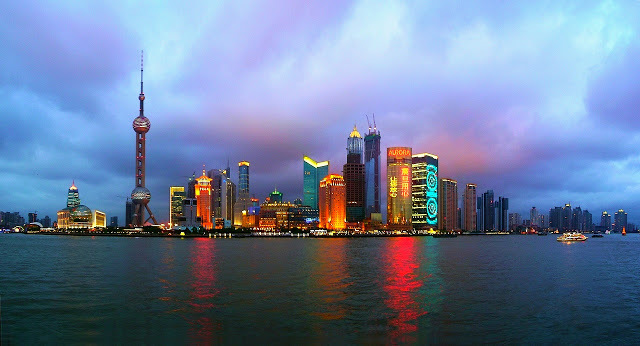 Turn around, and the sights on the other side of the river paint an entirely different picture: the Oriental Pearl TV Tower with it’s space-aged spheres, Shanghai World Financial Center, Jinmao Tower, and the recently completed Shanghai Tower - see image). We would return by day, but this was certainly something that needed to be viewed at night. 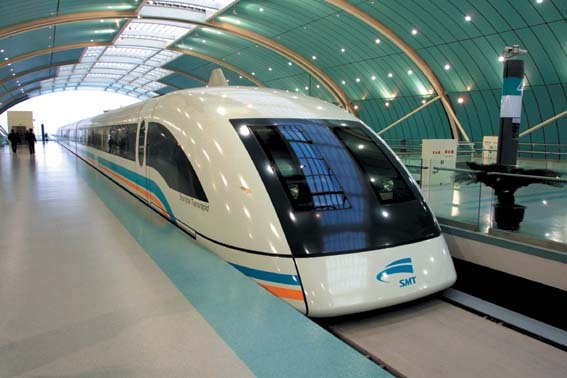 Anyone with a need for speed should experience Shanghai’s Maglev. The Maglev, or magnetically levitated train, is the only train in the world that levitates and has no wheels at all. During our short excursion, the Maglev took us to speeds as high as 431 kilometers per hour! That’s almost 240 miles per hour! The scenery outside our window sped by fast, but the ride was even smoother than the average commuter train. Except for when the other Maglev came passing us from the other direction. Even when we counted down, knowing exactly when it was going to happen, the swift pass made everyone on the train jump! After taking the fastest ground transportation in the world, we went to the top of the JinMao Tower for a 360-degree panoramic view of Shanghai’s cityscape. 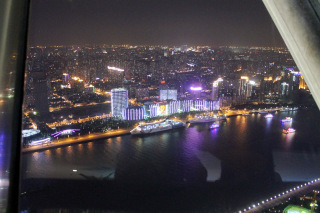 We were on the 88th floor, and it was exhilarating to view Shanghai from above. And to see, up and close, the construction of what later (on August 3, 2014) became the second tallest building in the world. Shanghai Tower was still under construction, so we could see parts of the twisted building complete and others still open to the elements, not covered by glass. 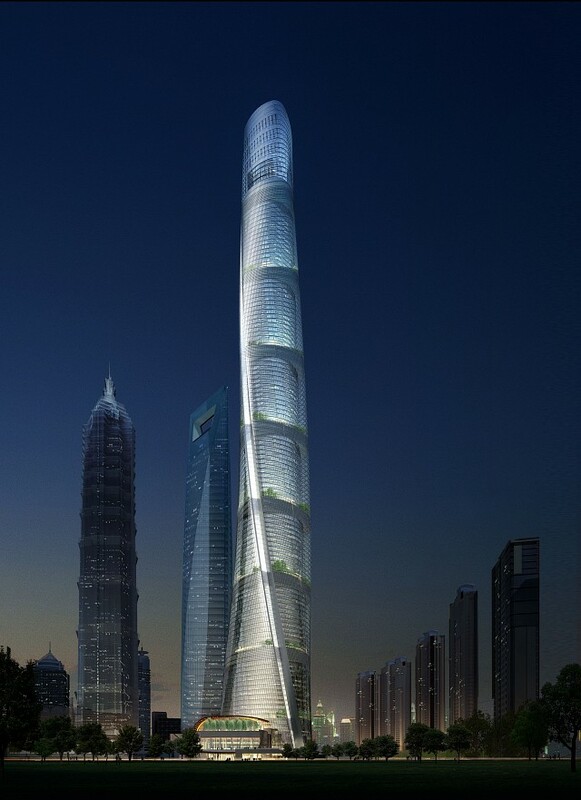 With 121 stories, it stands over 2,000 feet tall. Grounded after some time in Shanghai’s skyscrapers, we visited the Jade Buddha Temple to see, hear, smell, and experience the services. It happened to be an ancestral holiday, so it was quite busy and loud—making it a more exciting visit than the usual tour. The two Jade Buddha statues in question were brought to China from Burmain the 1800’s. The temple was originally built in 1882 to house the statues, but a fire in 1918 damaged the house. Now, three main halls are connected by two courts, and we were able to see a number of interesting statues, including golden ones, wooden ones that were painted a multitude of colors, and the two original statues of jade: one of a large reclining Buddha and the other a jewel-encrusted, seated Buddha that was carved out of a single piece of jade. Outside, many visitors and monks were burning offerings, singing, and dancing around the center temple. It provided great background music for our visit, and our exit. Our next stop: the People’s Park and People’s Square. 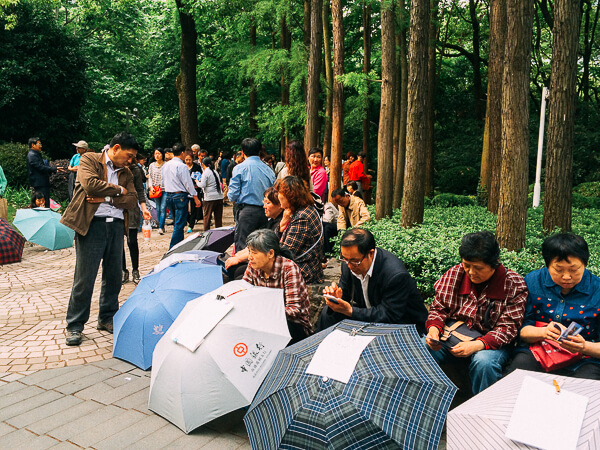 At the center of Shanghai, and a popular meeting place, the People’s Park and Square offered a vast area for strolling—sort of a smaller version of Central Park in New York or Golden Gate Park in San Francisco. Some of the features of the park we got to see included the Museum of Contemporary Art, Shanghai Art Museum, and the Shanghai Urban Planning Exhibition Hall (which shows a vision of the city as it should look in in the near future—as though the current view wasn’t futuristic enough). For lunch, we enjoyed a sort of Chinese fast food, highly recommended by our guide: Yang’s Dumplings. These “soup dumplings” were fried with soup inside the dumplings. Piping hot, they were tasty, but very sticky from the dough. Our guide laughed as we tried to eat. “You have to take a small bite from the top to open it, then slurp the soup out before you eat the dumpling!” We did as instructed, and the soup dumplings were delicious. Fortified by Yang’s Dumplings, as well as some sweets from the mall-like arcade, we went to the French Concession to explore the twisted side streets of old Shanghai. Crowded with tourists and foreigners, it probably wasn’t much unlike China of 100 years ago, still filled with westerners looking for drinks, food, fun, and exotic goods. Yang’s Dumplings, being a modern chain, was nowhere to be found in this traditional neighborhood. However, there were plenty of cafes and restaurants that sold soup, along with everything from duck to dumplings, ice cream to ice-cold beer. It’s easy to see how people get lost in these twisted side streets. I imagined the opening scenes of an Indiana Jones movie. When we passed the location of Shanghai’s World Expo, our guide, somewhat in jest but seemingly serious, told us that even though most World Expos are intended for the nations of the world to showcase new technologies and innovations, when it was held in Shanghai, no countries wanted to bring their latest and greatest for fear that China would duplicate knock-offs overnight. Most displays at the Shanghai World Expo were focused on nature and tourism, not new innovations. A World Expo like no other. We spent our evening at the theater watching Chinese acrobatics and stunts. We went to see the ERA Intersection of Time show. We wouldn’t go as far as to say “miss it and you miss shanghai,” as their marketing copy claims, but it was certainly a worthwhile show with intense moments and dangerous stunts. In addition to illusions and impressive lighting tricks, the show featured jar juggling from the Han Dynasty, human sculptures and contortionists, hoop diving, , performers climbing and soaring trough the air on silk ribbons, even eight motorcycles racing inside one “ball of death” at the same time! It proved a flashy Shanghai end to a flashy Shanghai visit. Eric’s short fiction and travel stories have been published in dozens of periodicals, including Go Nomad, InTravel Magazine, TravelMag, The Baltimore Review, The Pedestal Magazine, The Potomac, JMWW, Barrelhouse, Scribble, Grub Street, Syndic, and New Lines from the Old Line State: An Anthology of Maryland Writers. Eric reads regularly from his fiction on Baltimore's NPR station, WYPR, at book festivals and events, and he curates and hosts the popular Lit and Art Reading Series at the Watermark Gallery. Learn more about Eric and his writing at www.EricDGoodman.com, where you can listen to radio readings, read excerpts travel stories, and more.